By default when you send an email through our system to a client, it will be sent from the email address myproposal@proposify.com. We do this because if we were to send from your own address, many email providers, like Gmail, will regard it as spam because it doesn't match the domain sending the email. Nine times out of ten this is ok. Most clients will see your own name in the 'from' field, and not even look at the email address. When they reply to the email, we use your own email address in the 'reply-to' field, so it will go directly to you. Select the link and you'll be taken to a Postmark page that will tell you your email is confirmed. Don't be too intimidated by this. 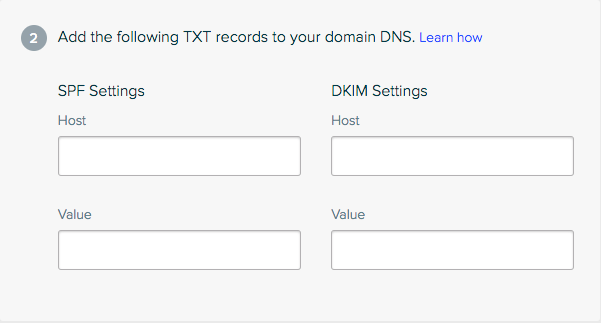 It's fairly easy to add these records to your DNS settings where your email address is hosted. If you don't know how, ask your hosting provider or IT support. Note: Once you add the records to your DNS settings, any other email addresses from that domain will also be done as well, so you only need to do this once. They will still have to verify their email and go through the steps in Proposify. It may take 12 hours for the records the setting to become active, so click the verify button to confirm the records are set up properly. Once it verifies, you will then be able to send emails to clients through Proposify using your own email address! If you already have an SPF for another reason you'll need to merge our SPF record into your existing one, not add a new one. You may need assistance from your IT people or your hosting provider to get this working depending on your setup.